Our master bedroom is coming along VERY slowly, but surely and I am excited to finally share one of the finished projects with you. I’m sure many of you have seen several different versions of this “Ikea hack” (apparently that’s what they call it, lol) as I found it online while searching around for a great cube table. It’s literally just two side tables from Ikea fashioned into a cube shape, painted and then decorated with a “nailhead trim”. I put that in quotes because nailhead trim is crazy expensive so I substituted in gold thumbtacks from the dollar store. I was incredibly happy with how the table turned out, it replaced a really tiny mirrored bedside table that we previously had been using. I love the extra room which allows for a few decorative accents up top and storage space for some of my jewelry on the bottom. This can be painted in ANY color and decorated in so many different ways that you could use this for so many different things! The best part – I spent $25 total to make this table! 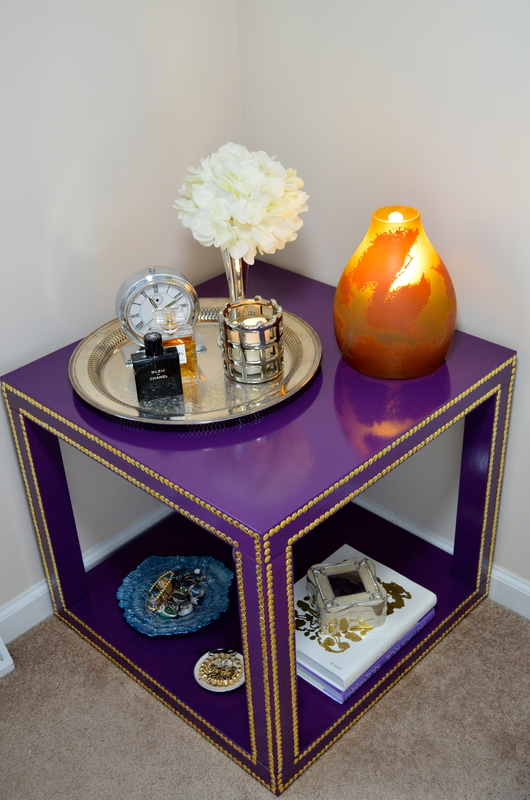 Start off with two Ikea LACK Side Tables in whatever color you want (we chose white because we figured the purple paint we were using would cover it well). The tables come in 7 colors so if you like one of those colors you don’t even have to paint them! If you’re choosing a custom color t paint the table, use a sanding block (or if you’re lucky enough to own one, a power sander) to prep your surface. Get paint in the brand and color of your choosing, I went to Lowe’s and in our case we got the 8 oz. Sample of Valspar’s ‘Plum Good’ with a satin finish. 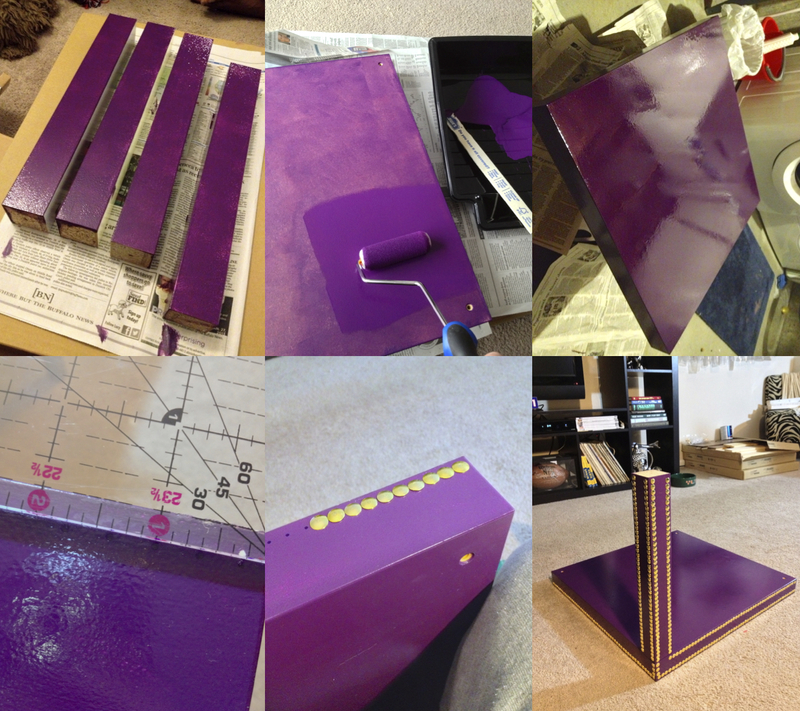 The sample size was more than enough paint to do two coats on all the pieces and still have some leftover for touch ups. You’ll also need a mini pack of foam rollers, a plastic paint tray, and (if you choose to clear coat seal your table) Kyrlon’s Crystal Clear Spray Coating. Roll on a thin coat of paint on all sides of 4 of the legs and both table tops. Allow the directed amount of dry time in between coats and then roll on a second coat. If using a clear coat, spray on once the second coat of paint is completely dry and then let dry overnight. You can build the cube now if you like or you can add the “nailhead trim” like I did. If you want to spend the extra money, go ahead and attach the trim onto the cubes in whatever design you want. If you want to go the frugal route, then get packs of gold thumbtacks from the dollar store. Since I knew my cube was going in the corner of my room and that only two sides would be visible, I only did the trim on those two sides… no need to make unnecessary work for myself! I figured out the spacing so that the thumbtacks would be right up next to each other and marked it on the table pieces… in my case it was 3/8″. I then used a rubber hammer and added the trim. Once all the trim was done, I made the cube by gluing the legs onto the bottom first using E6000 glue. I glued these instead of using the metal pegs that came with the table because I wanted the legs as close to the edge as possible to give it a more seamless look. Once that was dry, I glued the top of the table on. There were some gaps in the thumbtacks where the legs met the tops so I took the pins off the back of the tacks and glued the tack tops in the open spaces. I’m sure I will play around with the decor and the styling of the table, but below is a closer look at what’s on there right now. On the lower part of the cube I have a couple of books that picked up the table’s colors well and a jewelry box that was given to me 10 years ago the night of a scholarship program I was in. I love the woman who gave it to me and the message engraved on it reminds me of how much she’s always supported and encouraged me so I like having it be the first thing I see when I wake up! I moved the ring-bearer bowl from our wedding that used to be on my vanity to the bottom along with a bird-fountain jewelry holder that used to be on our dresser. I have a really cool luster glass plate that usually houses all my rings and I’m hoping they make it in a different color since the blue doesn’t go in the room anymore. I am leaning towards getting this giant bowl and moving all the jewelry to there. 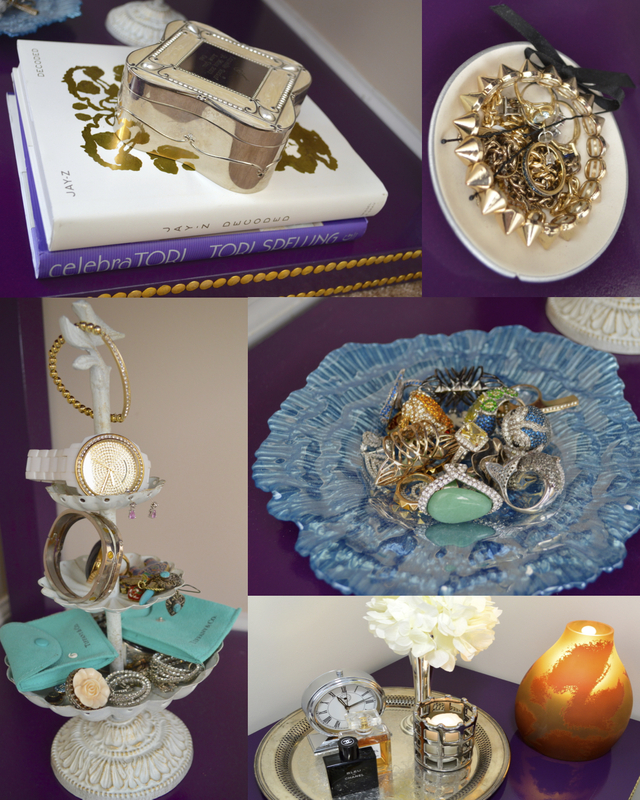 On top of the cube is a vintage silver tray that I got at thrift store a few years ago. Right now it’s holding a vintage silver julep vase with white hydrangeas, a silver clock, my husband and mine’s favorite cologne and perfume, and a really cool silver crosshatch candle holder. The lamp is from Ikea and I’m still deciding on it… I love the gold and brown colors that help accent the nailhead trim but I think it’s too short so I may look into replacing that. good for you! this is beautiful. I’m going to Pin everything on this page!!! im so inspired! Thank you! I love that you’re inspired… that’s the reason I do what I do! Thanks! My husband picked the color I’m loving it! Best Ikea malm table hack I have seen so far. Fabulous colour. Thank you so much… it’s definitely a bold color but I am loving it!